The Clovis du Poitou brand came about due to the locale of the LOEUL & PIROT head office. Firstly, by being situated in the heartland of the Poitou Charentes, and secondly aided by the commitment of the regional breeders. 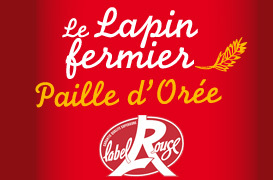 It was therefore that this privileged partnership between LOEUL & PIRIOT was born. Today, 1 out of 2 French people often think they don’t know about what they are eating. 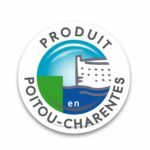 They therefore favour purchasing food products made in France (81%) and make an effort to find the provenance of the food they are buying (77%). 97% of those questioned buy locally sourced foods, and 59% of those reckon they will eat better in the months to come. Being a local shopper for food is becoming very “of the moment”! Furthermore,a quarter of French people buy their food products locally rather than in the big supermarkets. The Colvis brand was born as a response to this demand that is very real . The Poitou Charentes still remains remarkable for its rural character, with some 68% of the land surface being given over to agricultural activity. The regional agriculture is divided into 4 main activities: pastoral farming, grain cultivation (arable) wine production and other local high value agri – business. Amongst the stock breeding industry one can quote (2) the rabbit farming as the 3rd biggest breeding and production areas. It is mandatory that the Clovis du Poitou rabbits are born, bred and matured in the Poitou Charentes. This close relationship between breeder and producer allows for a reduction of transport time for livestock. A range dedicated and composed of purely rabbit. The traceability is highlighted on the wrapper. 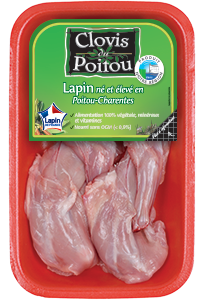 A regional recipe is printed on the outer wrapper of the rabbit. Industries Alimentaires) that aims to take dynamic action for the economic development of the region. The companies under the ARIA adhere to a mission statement that is both rigorous and approved by an independent commission. The businesses that are recognised by this body are held to the high standard of the stamp of approval: Economic development, loyalty to regional principles and identity, solidarity, citizenship, quality and food safety and sustainable development.